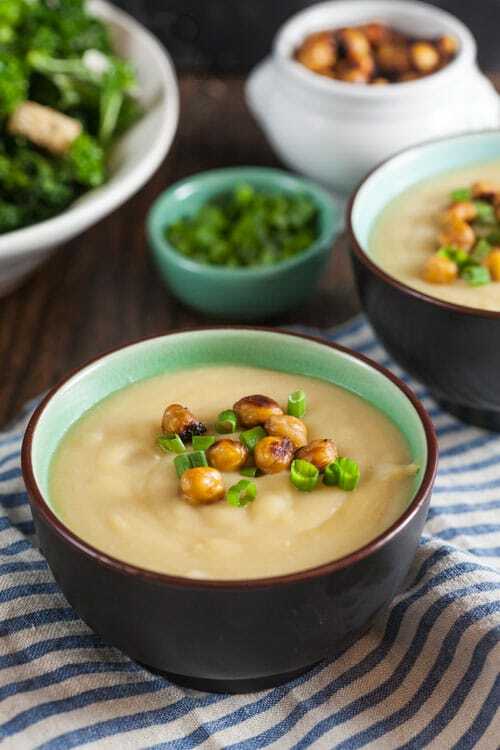 Miso Potato Soup with Crispy Chickpeas | Healthy. Delicious. 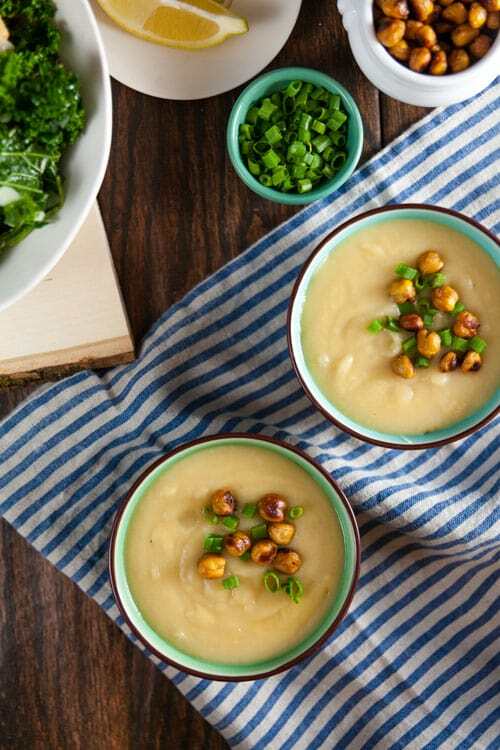 Miso Potato Soup with Crispy Chickpeas is the perfect way to warm up on a cold winter day. 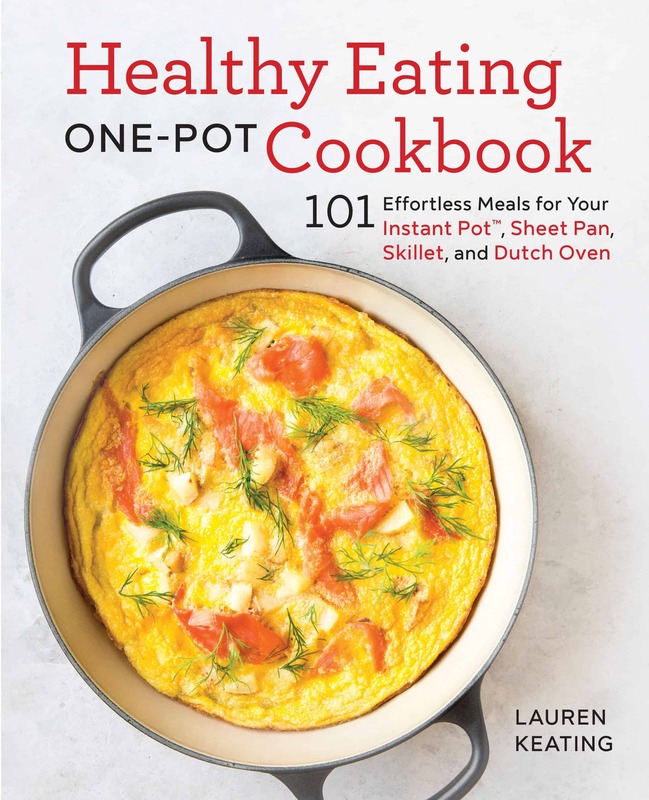 When Idaho® Potatoes asked me to develop a new soup recipe for them, I stressed for days. I had no idea how I was going to come up with an idea that hadn’t already been done to death. Then, inspiration struck. I have no idea where the idea to add miso to a simple potato soup came from, but I’m so glad I gave it a try. I can’t even begin to tell you how much I love this recipe. It’s one of my favorite recipes ever and I crave it constantly. 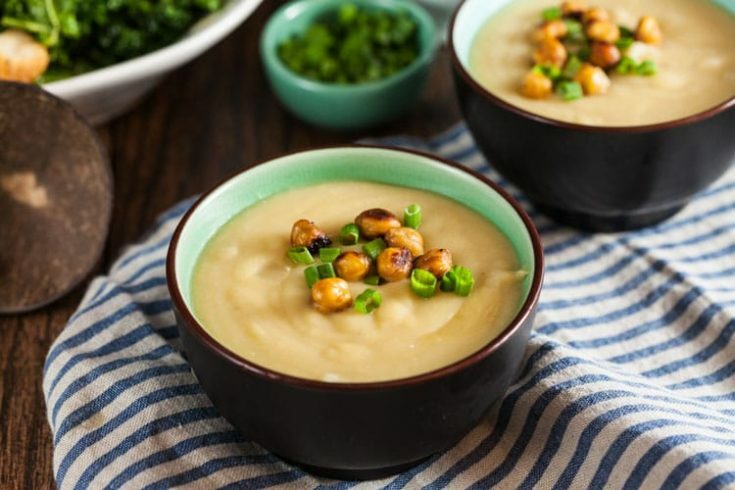 Luckily it’s really easy to make – and since all of the ingredients are staples, I can whip up a pot of miso potato soup just about any time I want. Serve it with a kale Caesar salad for an easy and healthy dinner that’s perfect for this time of year. 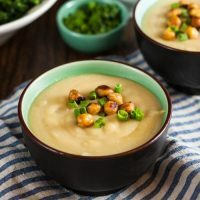 This miso potato soup is thick and velvety smooth, almost like really thin (yet super flavorful) whipped potatoes. Miso paste adds a ton of depth to the soup, giving it a punch of earthy yet slightly floral flavor. It’s hard to describe, but it’s amazing. I love topping thick, creamy soups like this one with a little something crunchy to give it textural interest. Crispy roast chickpeas proved to be the perfect accompaniment. 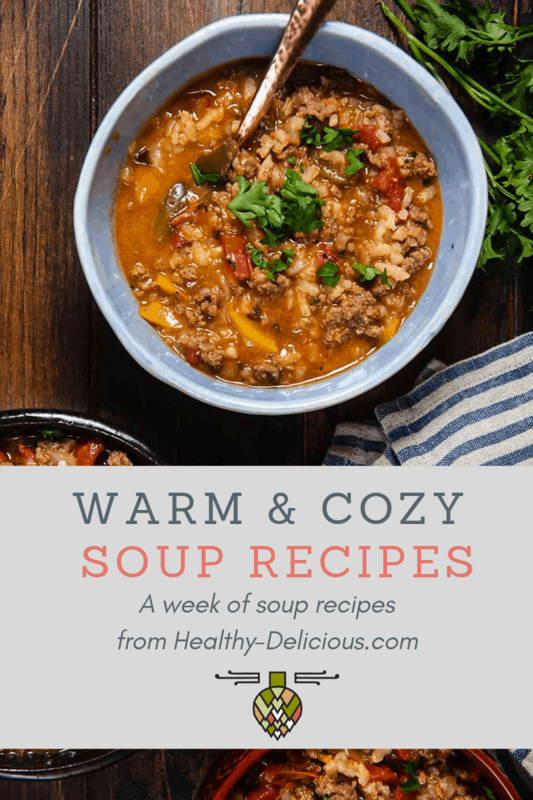 They have a mild flavor that’s a little bit sweet and a little bit salty, so they complement the soup really nicely without overpowering it. First, be sure to sweat the onions over low heat. This is a departure from the way I normally do things, but it’s important for this recipe. You want them to soften, but not take on any color. That way, the flavor will stay mellow and sweet and they won’t discolor the soup once everything is blended together. Next, be sure not to overcook the potatoes. Stop as soon as they’re fork-tender, otherwise they’ll start to break down and get grainy and the soup won’t have that velvety texture that I love so much. If you want your soup to be hotter, you can rewarm it after blending. Heat oven to 400ºF. In a medium bowl, whisk together the olive oil and 1 teaspoon miso paste. Add the chickpeas and mix to coat. Spread on a baking sheet in a single layer. Bake 30 minutes, stirring halfway through. In a large soup pot, melt the butter over low heat. Add the onions and cook until softened, about 5 minutes. Stir in the garlic; cook 1 minute. Stir in the miso paste. Add the potatoes to the pot and pour in enough stock to cover the potatoes. Increase heat to medium-high and bring to a simmer. Let simmer until the potatoes are just fork tender, 10-15 minutes. Transfer half of the soup to a blender; blend until smooth. Repeat with remaining soup. 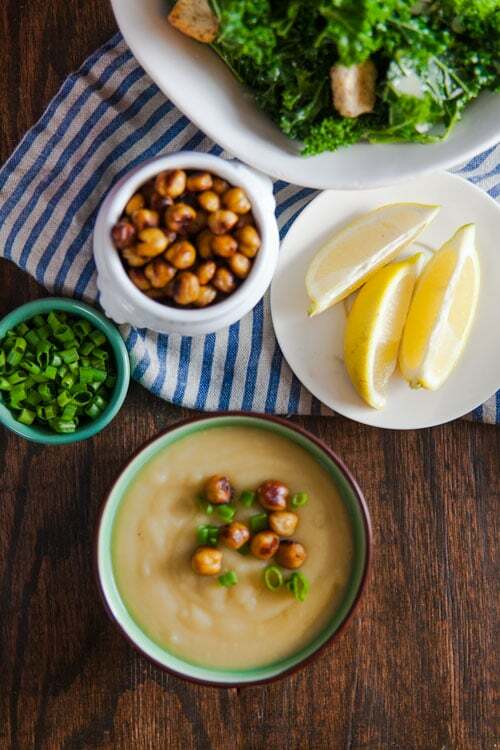 Serve topped with scallions and crispy chickpeas. I created this miso potato soup recipe for my client, . Thank you for supporting the brands that keep me inspired in the kitchen. I have been thinking a lot about Miso lately but have never thought of cooking Miso like this. Sounds like a wonderful recipe! Gotta try it! This soup is gorgeous and so innovative! I love how you can just tell how velvety smooth it’s going to be. Girl, these photos. They are just a feast for the eyes. If anybody can photograph a beige-colored potato soup and make it look beautiful, it’s you. Bravo. This soup looks mega delicious and healthy. Do you think it might be just as tasty with a vegetarian soup stock? I’ll try it with my homemade and see. Miso always makes me feel good, like I’m eating a whole garden. I’ve shared this as Recipe of the Day today on my foodie Facebook page and on Twitter. I don’t have white miso paste, but I now I want to buy some to try out this soup! That is velvety soup perfection. Love the flavor combo! I love it all but you totally had me at crispy chickpeas! How very interesting adding miso. I bet the flavors are wonderful Thanks! Those roasted chickpeas on top are great. Looks so smooth and creamy and I love the flavor combination! I’ve never tried anything like this! What a nice change from the usual cream soups this time of year! This looks so satisfying for a cold winter day. And the pictures are gorgeous! I can’t wait to try this! I had to share this! First, my husband LOVES potatoes. He could probably live off them. Secondly, he LOVES miso soup, so you just combined his two favourite things! I need to pick up some miso paste and get on this! I am obsessed with this flavor combo! It sounds lovely!